FOXBOROUGH -- Randy Moss vigorously denied allegations he committed battery against a Florida woman in her Fort Lauderdale, Fla., residence earlier this month. Rachelle Washington, 35, who claimed she has had an intimate relationship with Moss since 1997, received a temporary restraining order in the Broward County Court against the Patriots wide receiver Monday. In her petition, Washington alleged Moss caused her serious injury in the Jan. 6 incident and denied her medical attention. 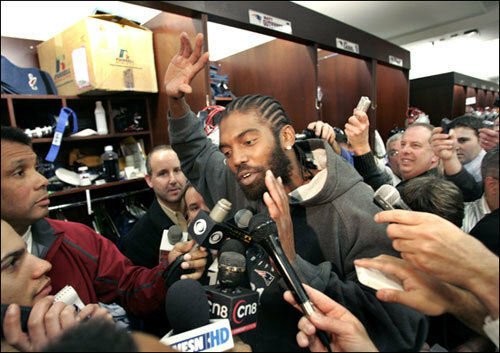 "It's unfair to athletes if a person makes a false claim," said Moss, standing in front of his locker at Gillette Stadium. "You know, there is nothing we can do. The only thing we can do is either pay up or sit back and listen to what's been said or what's being written. I can honestly say . . . for someone to make a false claim about me, I'm kind of furious. "My situation is where I felt that I did nothing wrong. It was an accident. Whatever happened, it was an accident. I wish I could sit here and tell you all what happened. But there is a lawsuit or whatever coming against me; I can't really explain or tell you all what is going on." Moss, 30, who in his first season with the Patriots set an NFL record with 23 touchdown receptions and broke the franchise record for receiving yards with 1,493, said he was "mad at this situation of extortion." He claimed Washington was seeking "six figures" to keep the alleged battery hushed. As for Washington's claim that she was prevented from seeking treatment, Moss said, "How am I going to deny someone medical attention when you live by yourself and have your own vehicle?" Minneapolis attorney Joe Friedberg, who has provided legal counsel to Moss in the past, said the player's agent, Tim DiPiero, told Friedberg that the lawyer representing Washington asked Moss for $500,000, or her allegations would be made public. "The whole thing is outrageous," said Friedberg, who is obtaining legal representation in Florida for Moss. Efforts to reach Washington's attorney, David McGill, were unsuccessful. According to court documents, the terms of the injunction call for Moss to remain 500 feet away from Washington, and he's prohibited from using or possessing firearms. Moss did not go into detail about the incident, which happened during the Patriots' playoff bye week. But he said he's never hit a woman and that he was looking forward to clearing his name. "It's hard, because of everything I've been through, mostly the negatives, off the field," said Moss. "Battery - I didn't hit no woman. I've never laid my hands on a woman. So, for you to say battery, now I think if there was such a thing in the court system as an accident, then that's what I'm guilty for. But for you to say I physically, or in an angry manner - whatever the manner may be - put my hands on a woman physically, I've never done that." However, in an incident in 1996, Moss and Elizabeth "Libby" Offutt, the mother of his four children, both were charged in a domestic dispute after police were called to Offutt's home in St. Albans, W.Va., St. Albans police chief Joe Crawford said yesterday. Police filed a criminal complaint alleging that Moss repeatedly pushed Offutt down as she tried to rise from a sitting position and threw "steaming" hot water on her when she told him to leave, the Charleston (W.Va.) Daily Mail reported at the time. The complaint, filed in Kanawha County Magistrate Court, stated that Offutt, then 21, had abrasions on her neck and face and minor cuts and bruises on her arms, the paper reported. Moss, who was 19, told police that Offutt hit and kicked him and broke his gold necklace, according to the newspaper's account of the complaint. Misdemeanor domestic battery charges against Moss and Offutt were dismissed after they agreed to counseling. Crawford said he could not locate a detailed record of the incident, only a report that contained basic information. "I can confirm that we responded to a domestic disturbance" involving Moss and Offutt, Crawford said. "Both of them made allegations that they were assaulted by the other one, and we arrested both of them." Moss said he told coach Bill Belichick about Washington's allegations last Friday, one day before the Patriots defeated the Jacksonville Jaguars, 31-20, in an AFC Divisional playoff game. Moss said Belichick advised him to just focus on playing football and handle it after the season. "I brought it to Coach and said, 'Look, Coach, I'm being threatened to do something that I have no idea of what I need to be doing.' Whenever the season is over, I plan on sitting down and really getting to the bottom of this. Right now, I have a job to do." Asked about the allegations, Belichick said, "I talked with and I support Randy 100 percent." According to Broward County court records, a hearing will be held Jan. 28 at 3 p.m. to determine if a permanent restraining order will be granted. If the Patriots defeat the San Diego Chargers in the AFC Championship game Sunday, they would be in Arizona preparing for the Super Bowl, which will be held Feb. 3, during that time. According to Friedberg, Moss does not have to appear at the hearing. "A lawyer will appear for Randy and agree that he doesn't want to come within 500 feet of her and probably get a reciprocal order that she can't contact him," he said. "If she sues him later, then so be it. But there certainly is never going to be any criminal charges arising out of this." Moss, who has been dogged by character questions in his 10-year NFL career - including a 2002 traffic incident as a member of the Minnesota Vikings in which he knocked a Minneapolis traffic control agent to the ground with his car and was later charged with drug possession - quickly put those concerns to rest in New England. Since being acquired from the Oakland Raiders for a fourth-round pick in a draft-day deal last April, he has been lauded for his professionalism and his leadership in the locker room. Teammates stood by Moss Wednesday, saying his latest legal trouble won't be a distraction heading into Sunday's game. "That's the furthest thing from my mind," said quarterback Tom Brady. "We've had a lot of distractions this year and we just push on," said linebacker Tedy Bruschi. "By me saying he's a teammate of mine, and I'm saying that, he's actually more a family member and I support him." Moss, however, called the incident a "black cloud" hanging over his head. "That's something I did not want coming into the season, is anything negative," he said. "Everything I tried to do - from getting here early, and making sure I eat the right food, all the way to practicing and playing good - I wanted all that to be an A-plus." Christopher L. Gasper can be reached at cgasper@globe.com; Globe staffers Bob Hohler, Mike Reiss, and Michael Vega contributed to this report.